PR News saluted the winners and honorable mentions of the 2011 Digital PR Awards at a luncheon event on October 4, 2011, at the Grand Hyatt in New York City. More than 200 communications leaders attended this prestigious event which celebrated creativity, technical savvy and storytelling skills in digital communications. It&apos;s a cliche to say that all the finalists are winners, but in the case of the 2011 Digital PR Awards, all the campaigns and teams that were honored on Oct. 4 and in our special issue capture the inspiring combination of public relations at its finest and the expanding power and reach of digital platforms. Congratulations to all of the winners and honorable mentions! As a leading provider of cancer care, the Baylor Charles A. Sammons Cancer Center felt a responsibility to share its expertise beyond its immediate facility. In an effort to reach existing patients, as well as survivors and their families, the PR team, led by social media manager Ashley Howland, launched the cancer center’s first blog: Sammons Says. Euro RSCG Worldwide PR – The Sisterhood: Recognizing the power of teenage girls as consumers, Euro created “The Sisterhood,” a social media “lab” by, for and about teen girls. Shift Communications – Slice: The Agency Blog with a Real Bite: Each quarter, a new group of Shift staffers contributes to Slice, which showcases their individual perspectives on PR, social media and staff events and excursions. The CEO of Euro RSCG Worldwide PR, North America, has a lot on her mind—and many of those thoughts go out to audiences via platforms that include the Huffington Post, The Holmes Report, CNBC.com and more. Salzman’s proclivity to post coupled with her expertise in business has resulted in regular invitations to guest-blog—and she usually accepts. Salzman riffs on a variety of topics, from presidential politics, the Arab Spring and the powerful voice of social media to crowdsourcing and football caused brain injuries. It’s the brain that was the impetus for Salzman’s powerful four-post series, “Headstrong,” which appeared in HuffPo in 2010. The series chronicled Salzman’s experiences as a brain cancer survivor. Todd Defren – PR-Squared, Shift Communications: Since 2004, Todd Defren’s blog has given its readers deep insight into PR and social media, attracting 7,400 registered readers to date. Jim Joseph – Lippe Taylor & ShopPR: Jim Joseph’s The Experience Effect blog on marketing averages 6,000 visitors per month, which has resulted in 2,000 Twitter followers and 1,500 links on LinkedIn. Cohn & Wolfe New York – American Girl Inspires Girls to Shine with Online Charitably Driven Product Launch: A grassroots program inspired girls to visit the Shine On Now Web site and contribute a free “star” to help American Girl donate $1 million to four charitable organizations. Edelman & Best Buy - Sustainability Report Goes Interactive: In concert with the Best Buy CSR report launch in July 2011, Edelman executed a sustainability webinar that featured live video streaming and Twitter conversations. To merge the popularity of HD video and the burgeoning trend of user-generated content online, MWW Group and Nikon created an online film festival that relied entirely on social media. Siemens Industry Inc. - Plantville, a Siemens Initiative: Siemens developed an interactive Facebook game that simulates a plant manager’s experience, challenging players to increase productivity, sustainability and the overall health of a plant. Weber Shandwick New York - Suave Smart Splurge Contest: The first 100,000 contestants received free full-size Suave Naturals Body Wash or Body Lotion and one grand prize winner a trip for two to Hollywood. The contest featured celeb Brooke Burke, who encouraged women to splurge on items guilt-free. To create renewed interest in a major international horse-racing event, the Breeders’ Cup, Conover Tuttle Pace found the perfect narrative for the 2010 event in Zenyatta—a female horse known for fun personality and an undefeated record built on come-from-behind wins. Creating a robust social and digital media program, CTP created a personalized Twitter handle and a microsite for the horse; led a “Zenyatta Fan Video” contest on the event’s Facebook page; and relaunched the BreedersCup360.com Web site that served as the bettors&apos; guide to the event. In fact, they even provided a live stream of The Draw and created an official iOS app for the event. Inner Circle Labs – Zite Gets Personal: At SXSW, the Zite team mixed cocktails for attendees who downloaded Zite’s iPad app. The Zite team would then take pictures of the attendees holding Zite-branded tumblers to the company&apos;s Twitter handle. The campaign helped the company race its away from 200 to 13,000 Twitter followers. Orange County Transportation Authority – Angels Express Digital Marketing: E-mail blasts, paid advertisements on the LA Angels&apos; Web site and Facebook ads all directed visitors to a unique landing page on OCTA.net. The campaign eclipsed expectations and achieved 33% ridership on the exclusive service for LA Angels’ fans. MWW Group – 2010 Celebrity Bowling Hall of Fame Campaign: MWW launched a voting campaign for fans to induct their favorite celebrity into the International Bowling Museum & Hall of Fame. Voters were rewarded with a coupon for a free game of bowling. The campaign generated 1.3 million votes and drove immense traffic to bowling centers during National Bowling Week in August 2010. Siemens Industry Inc. – Plantville, a Siemens Initiative: Siemens created an interactive Facebook game that simulates a plant manager&apos;s experience in an effort to educate people on issues relevant to today&apos;s plant environment. The game had almost 16,100 players and 81,300 unique visitors 16 weeks after launch. General Mills Inc.- Honey Nut Cheerios "America&apos;s Favorite Cereal"
GolinHarris – Magnum Ice Cream U.S. Launch: Actress Rachel Bilson voiced Magnum’s luxury brand message through multiple digital touch points. GolinHarris and MetroPCS – Snoop Dogggg Launches the MetroPCS 4G LTE Samsung Galaxy Indulge: Snoop Dogg became Snoop Dogggg (with 4G) to promote MetroPCS’ new 4G phone. Pappas Group – .CO Internet S.A.S. Launch: Pappas deployed social media and viral videos to get the word out about the new domain registration name. U.S. Army with Weber Shandwick – Sharing the Army Strong Story: Increasing social engagement with potential recruits, an iPhone app, Facebook and Twitter helped the Army exceed recruitment goals for 2010. Dixon Schwabl and The Heritage Classic Foundation – “Get Your Plaid On”: An old-time logo inspired a social effort that included a “pick the plaid outfit” contest. Jones Lang LaSalle - Jones Lang Lasalle the Year of the Corporate Real Estate Executive: Vlogs help put real estate firm front and center at the CoreNet Global Summit. Visit Newport Beach Inc. - “Escape Car-Mageddon” Ride the Waves Instead of the Breaks: Leveraging a planned shutdown of the 405 freeway in Los Angeles, a video encouraging people to visit Newport Beach received more than 500,000 views. Dixon Schwabl and The Heritage Classic Foundation - Get Your Plaid On! Visit Newport Beach Inc. - "Escape Car-Mageddon!" 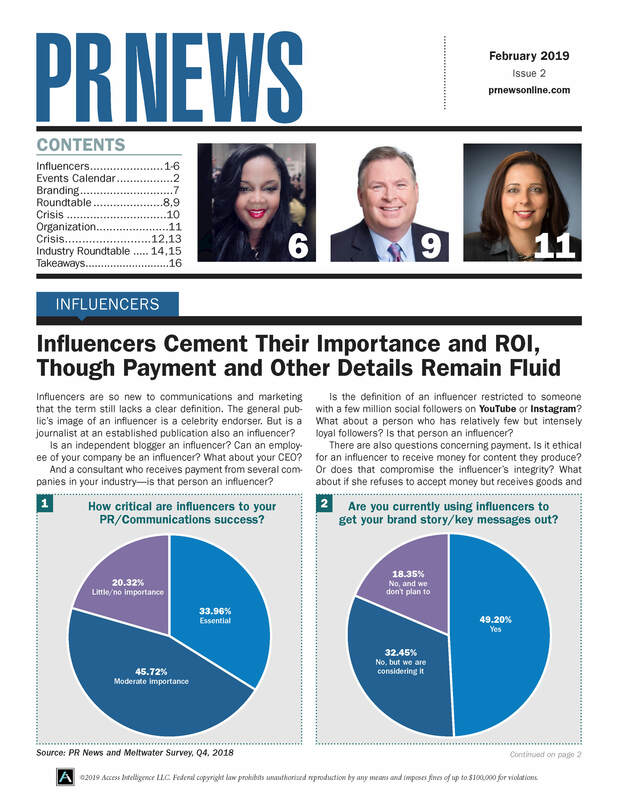 The American Institute of Certified Public Accountants – CPA Letter Daily: The free interactive pub tackles the 10-12 most important stories for more than 172,000 member subscribers. Cold Spring Harbor Laboratory’s Monthly NetLetter: Monthly pub by the molecular biology and genetics lab has 6,000 subscribers and is shared on Facebook and Twitter. It’s not easy connecting more than 260,000 active employees spread among hundreds of business units with jobs ranging from corporate strategy development to call center workers. But AT&T managed to do just that by leveraging a behind-the-firewall-version of Facebook, Twitter and LinkedIn—tSpace. Enlisting the help of Fleishman-Hillard to help develop the platform’s functionality for the company, AT&T had four main objectives: introduce employees to tSpace by inviting them to fill out employee profiles; raise awareness of tSpace collaborative tools; recognize individuals with expertise in their fields as thought leaders; and foster friendly competition among employees while providing useful, business-oriented recognition and accreditation. The American Institute of Certified Public Accountants – Team Network News: Three pubs and an Intranet hub designed to give AICPA employees the tools and resources required to be successful in their jobs have resulted in nearly 100% readership and satisfaction scores. American Airlines and Weber Shandwick - Mystery Miles: More Than 230,000 Take Flight on Facebook with the AAdvantage Program: Mystery Miles leveraged a custom-built Facebook app, which rewarded all participants with AAdvantage miles. RF Binder Partners Inc. - Talenti Gelato e Sorbetto Facebook Campaign: Using free, built-in platform tools, RF Binder leveraged the unique reusability of Talenti jars to develop a user-generated content sweepstakes on Facebook and increase fan engagement. Weber Shandwick & MilkPEP - Modern Family Got Milk? Ad Launch: The National Milk Mustache “Got Milk?” campaign and Weber Shandwick used the show Modern Family’s popularity and its 3 million Facebook fans to launch the first-ever Facebook Got Milk? ad. Cohn & Wolfe New York - American Girl Inspires Girls to Shine with Online Charitably Driven Product Launch: To generate coverage and word-of-mouth for the launch of American Girl’s Shine On Now program, outreach to parent influencers was conducted with 38 Parent Partners, who wrote about the program and drove traffic to the program’s site and through social channels. Euro RSCG Worldwide PR - Sears Blue Blogger Crew - Consumer Electronics: Bloggers from across the country were selected to act as media on behalf of Sears at the 2011 Consumer Electronics Show, covering CES announcements, new product launches and trends. Mom Central Consulting - Infantino Test-Drive Campaign: To launch the baby products company’s social media presence, MCC developed a four-phased nationwide program to seed new products with a select group of mom influencers. AT&T – AT&T Sustainability “Do One Thing” Employee Engagement Intranet Site: AT&T, in partnership with Fleishman-Hillard, created a personalized employee Intranet that encouraged and tracked employees’ involvement in the sustainable programs of their choice. Fun tools within the internal site includ quizzes, videos and even a poster-creation tool that allows employees to show pride in their commitments to sustainability. Launched in December 2010, the Dell Listening and Command Center was created to improve Dell’s customer service and product quality. The center is designed to listen to the conversations that are happening about the brand across social media in 11 languages around the world, with the goals of identifying issues, solving problems and increasing customer engagement. Dell monitors 22,000 daily Web posts to hear and respond to potential problems, and also identify trends. The team monitors and participates in online conversations while the Twitter support team, @DellCares, engages with the community. NEI and Burson-Marsteller – Digital Crisis Management for U.S. Nuclear Industry during Japan Crisis: After Japan’s earthquake/tsunami, B-M partnered with the Nuclear Energy Institute to ensure the industry’s nuclear safety messages reached core audiences. Porter Novelli – Gillette Social Media Analysis and Optimization: Porter Novelli tracked online conversations about Gillette in 11 different areas, including brand mentions, razor models and price complaints, resulting in improved response to customers. MWW Group – 2010 Celebrity Bowling Hall of Fame Campaign (BPAA): To elevate the sport of bowling, MWW engineered an online Bowling Hall of Fame election—propelled by celebs like Taylor Swift (the winner) and Jimmy Fallon—that attracted media with 20-something audiences. More than 1.3 million votes were cast. Weber Shandwick – Telekom Twitter- Reporter: Partnering with online, print TV and radio outlets, Deutsche Telekom consumer reporters tweeted out their favorite moments at special branded events. ASCD – ASCD Conference Planning Toolkit: ASCD’s toolkit featured a digital program book, a way-finder and scheduler, and an online city guide. Idaho National Laboratory – Video Gallery and Fact Sheets Archive: The archive incorporated technologies that enabled the use of low-bandwidth content that loaded quickly and required no special applications to view them. GCI Health/Johnson & Johnson – The Johnson & Johnson Campaign for Nursing’s Future: Happy Nurse Game Moible App: The Happy Nurses app, downloaded by 10,000 people, is part of an effort to recognize that nurses must attend to their own well-being to be able to provide for their patients. Jones Lang LaSalle – Jones Lang LaSalle Commercial Real Estate iPhone App: The go-to portable source of information for JLL’s stakeholders, the app received five stars in 92% of customer reviews. Waggener Edstrom Worldwide Inc. – Hot Spots: We Dig It! The Hot Spots app harnessed geolocation technology to increase awareness for Waggener Edstrom Worldwide’s Social Saloon SXSWi party. Waggener Edstrom Worldwide Inc. - Hot Spots: We Dig It! Weber Shandwick: Ragú Mom’s the Word on Dinner: Launched as a community for moms to talk about a shared, common experience—dinnertime— WS tapped Facebook and Twitter to extend the conversation and enable Ragú to offer delicious recipes and cooking and tips. GolinHarris – The Bridge: Holistic Engagement Studios: The agency’s Bridge offering drives real-time engagement for clients. For one client, three well-crafted tweets resulted in an estimated $20 million in ad value. VOX Global – Activism Central: This online campaign system, launched in Jan. 2011, enables PR pros to craft and launch their own powerful campaign Web sites. Adfero Group – 4K for Cancer: To help the nonprofit org consolidate its Web content for its summer bike rides program, Adfero created a central hub where stakeholders could learn more. Baylor Health Care System – Sammons Says: Viewpoints on Cancer Prevention, Treatment and Research: Baylorhealth.com is driven by team of bloggers that creates content with a “just-in-time” and “here’s what you need to know” viewpoint. Impress Labs – SAFC Live: The chemical and life sciences organization delivers key messages to lab managers, chemists and scientists via SAFC Live. Edelman – Shape What’s to Come By Levi’s: To reengage Millennial women with Levi’s, Edelman developed discussion boards, interactive live casts and an ambassador program. Fahlgren Mortine – Ansell’s Online Safety Community Grows 28%: To engage the Ansell audience of safety professionals, Fahlgren Mortine created SafetyCommunity.com, which drove traffic via polls and live chats. Cisco Systems Inc. - “The Network”: Cisco’s Technology News Site: Cisco’s tech news site lets users easily access content not only about the company’s business, products and technologies, but also stories on the broader business and technology landscape written by veteran, award-winning journalists. Fahlgren Mortine with Crown Equipment - Social Media Newsroom: Part of an integrated program that seeks to position Crown, a global forklift manufacturer, as the leader in industry discussion, the newsroom features widgets that pull in videos, photos and posts from Crown social media platforms. Intel & Ogilvy Public Relations Worldwide - Intel Reinvents Its Online Newsroom: Intel’s social-based newsroom includes features such as commenting, rating, discussion areas, content-rich media kits, special private access areas, Web video and more. Winner: Waggener Edstrom Worldwide Inc.
Waggener Edstrom’s digital initiatives in the past year were pretty robust. To name just a few, the agency worked with Microsoft Mobility, HTC and T-Mobile to launch the Windows Phone 7; developed and executed a yearlong campaign that shifted perceptions of Internet Explorer to the effect of 2.36 million downloads within the first hour of Internet Explorer 9’s launch; built a Web site for the Sasquatch! Music Festival, where users downloaded 20,000 songs on the first day the Web site went live; and created the "Hot Spots" app that used Foursquare data to show real-time heat maps in order to show SXSW attendees which events were the most popular. In fact, the "Hot Spots" app was downloaded 4,000 times by the time of WE&apos;s own event at SXSW. Edelman: The agency’s digital presence is highlighted by the Volkswagen Beetle Reveal effort in 2011, which generated 90 million Twitter impressions in 24 hours. MWW Group: MWW’s Dialogue Digital helped Sara Lee’s Jimmy Dean capture the largest share of voice at the 2010 BlogHer. Ogilvy Public Relations Worldwide: In 2010, Ogilvy PR Worldwide’s social media arm doubled its business. The 360° Digital Influence group created such firsts as the launch of the all-new Ford Explorer via Facebook. Ventana Public Relations: To build brands online, Ventana launched a New Media Engine that delivers content-driven SEO to thousands of new media sites. Weber Shandwick: Accounting for 20% of the agency’s total revenue, notable digital work in 2010 included the launch of the Pepsi Refresh Project. Euro RSCG Worldwide PR - Campaign Money Watch "They Win U Lose"
APCO Worldwide – Mars Healthy Living Online Campaign: Digital advertising and SEM drove increased awareness of Mars’ Healthy Living program. First Degree & Astute Technologies – KeepAmericaFishing: KeepAmericaFishing.org’s supporter management system features tools to engage anglers on advocacy and fundraising. Idaho National Laboratory – Video Gallery and Fact Sheets Archive: The redesigned INL site offers improved SEO and mobile compatibility. Turk Telekom – Communication (ileTTiim) for us! : In less than two months, Turk Telekom’s revitalized Intranet site increased employee traffic by 16%. Turk Telekom - Communication (ileTTiim) for us! To broaden the audience of the Science Channel’s An Idiot Abroad both on-air and online, the Discovery social media team, led by Gayle Weiswasser, VP of social media communication, leveraged Facebook and Twitter to drive viewership of the show. At the end of the season they hosted an all-day marathon that culminated in a live three-hour event, during which fans’ tweets were streamed live on air. The American Institute of Certified Public Accountants – AICPA Financial Literacy Initiatives: The Feed the Pig campaign offered financial savings tips via Facebook and Twitter. Kimberly Clark/Ogilvy & Mather Hong Kong – Huggies Babies-On-The-Go: Ogilvy created a Facebook group where parents could share baby photos. The most “liked” pics appeared in “Huggies Babies” promotions on buses around Hong Kong. MWW Group – Nikon Film Festival Social Campaign Championing DSLR Video: The first ever online film festival featured Ashton Kutcher and other celebs’ personal videos that inspired entrants to upload their own creations. American Airlines and Weber Shandwick - 30 Deals in 30 Days: American Airlines’ AAdvantage Program Celebrates 30 Years With a Tweet: The Tweet to Win 30,000 Miles campaign scored a 70% increase in followers for American Airlines. General Mills Inc. - MultiGrain Cheerios Wins Big on Twitter: Weekly Biggest Loser: Twitter parties with fans helped lift the Cheerios brand. NEI and Burson-Marsteller - Crisis Management for U.S. Nuclear Industry During Japan Crisis: After Japan’s earthquake/tsunami, “@NEIupdates” served as a focal point for messaging. PAN Communications - RedPlum Goes #ChicCheap with Holiday Gift Guide: The #chiccheap hashtag helped support a branded holiday party, which became a trending topic on Twitter. Fahlgren Mortine - Donate LifeOhio: To reach potential organ donors for Donate Life Ohio’s Green Chair campaign via Facebook, a custom tab gave new donors an easy way to register. GCI Health/Johnson & Johnson - The Nursing Notes by Johnson & Johnson Facebook Page: A special Facebook tab promoting the online version of J&J’s newsletter, Nursing Notes, generated 8,000 fans in its first year. USANA Health Sciences - USANA Health Sciences Facebook: To engage its Facebook community, USANA posted original content and updates during its annual convention. Peppercom and Whirlpool - Maytag Facebook: It&apos;s Good to be "Liked"
Baylor Health Care System - DRV NOW, TXT L8TR: To entice drivers to pledge that they wouldn’t text and drive, a YouTube video linked viewers back to a pledge microsite. CRT/tanaka and Network Solutions - Go Granny: How Network Solutions Stole the Super Bowl: A video campaign called “GoGranny” spoofed competitor GoDaddy’s ads during Super Bowl weekend. Visit Newport Beach Inc. - “Escape Car-Mageddon” Ride the Waves Instead of the Breaks: Leveraging a planned shutdown of an L.A. freeway, a video encouraging people to visit Newport Beach received more than 500,000 views. Weber Shandwick Detroit - Track to Street: Corvette Racing Series, 2010: A 12-episode video series gave fans intimate access into Corvette Racing’s team. The videos grabbed over 500,000 views. American Airlines and Weber Shandwick – Mystery Miles: More Then 230,000 Take Flight on Facebook With the AAdvantage Program: Within one week of the Tweet to Win 30,000 Miles launch, AAdvantage’s Twitter following increased by 70%. Mullen – Century 21 Real Estate LLC Buys Virtual Real Estate: Mullen’s campaign created Century 21-branded virtual structures within ngmoco’s popular “We City” mobile game in which players build their own cities. RF Binder Partners Inc. – Talenti Gelato e Sorbetto Facebook Campaign: Armed with a budget of $300, RF Binder developed a Facebook contest that highlighted the reusability of Talenti jars.